Over the past few months I have been involved in the Superdream project, which has been coordinated by ISIS Arts, The Trinity Session, Sticky Situations, The Swallows Foundation, Gateshead Council and others to produce Art for public spaces in both Gateshead and Jeppestown, Johannesburg and to create links between UK and South African artists. 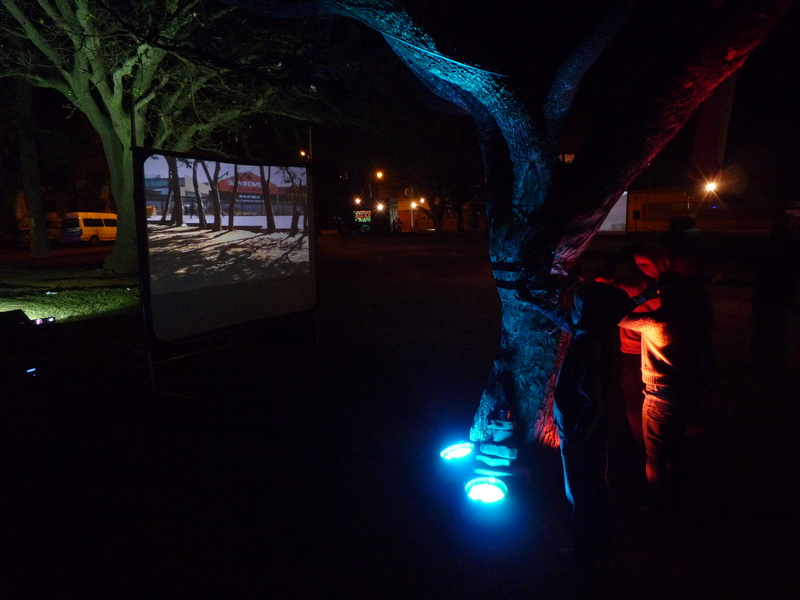 For the Superdream project I produced digital media art for two events, one in Windmill Hills Park, Gateshead and one in Jeppe Park, Johannesburg. 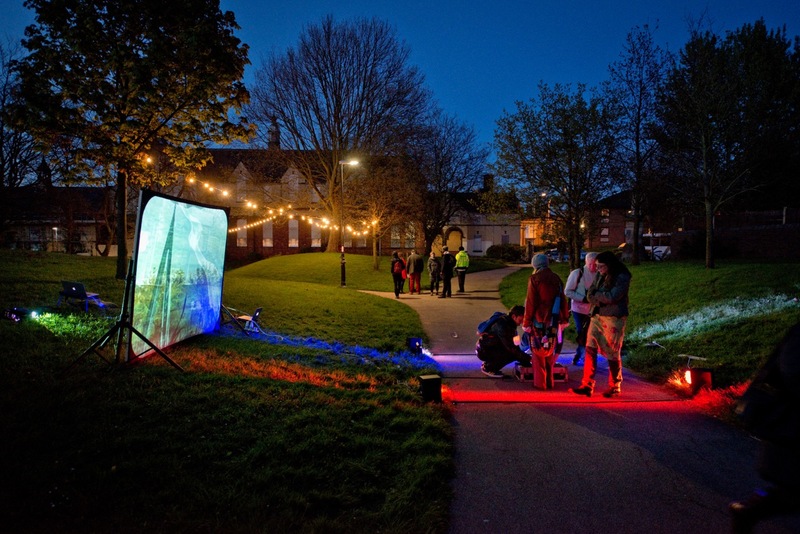 Both areas were ‘undeveloped’, and one of the aims of the interventions in these spaces was to redefine public space through art, technology, innovation and a sense of community. 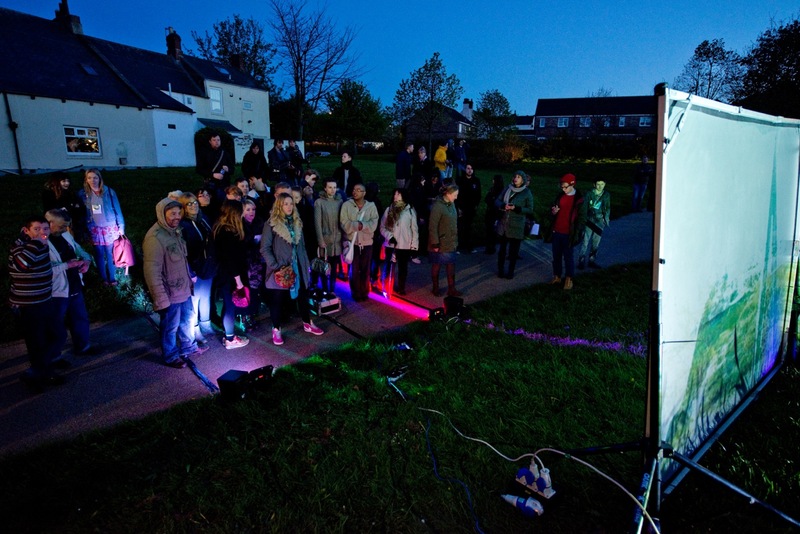 In Windmill Hills on May 2nd 2014 I presented an interactive audiovisual work, in stages of development. 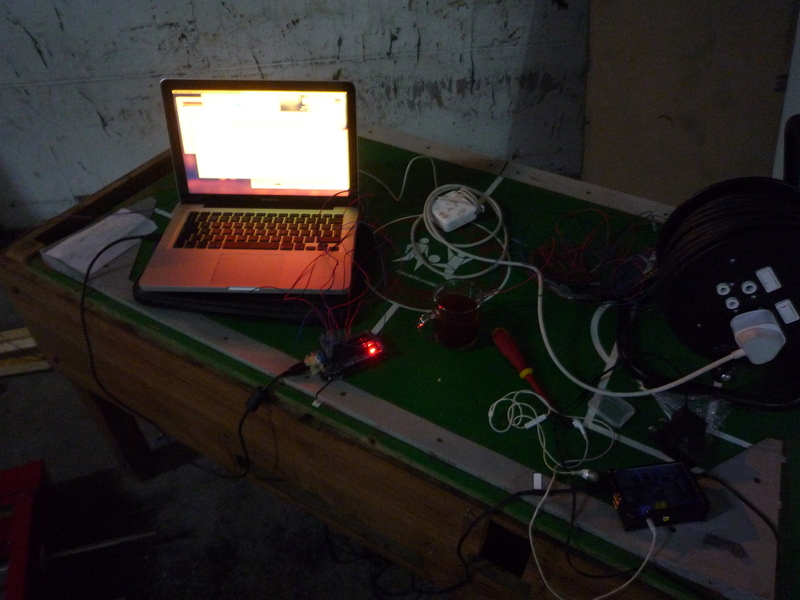 ‘Polyfields’ used four HC-SR04 ultrasonic distance sensors on an Arduino Mega 2560 programmed in Arduino’s IDE to output the distance of objects from the sensors, and these distances were used by Pd-extended to be the controls for a four channel audio piece, as well as a four channel video piece. 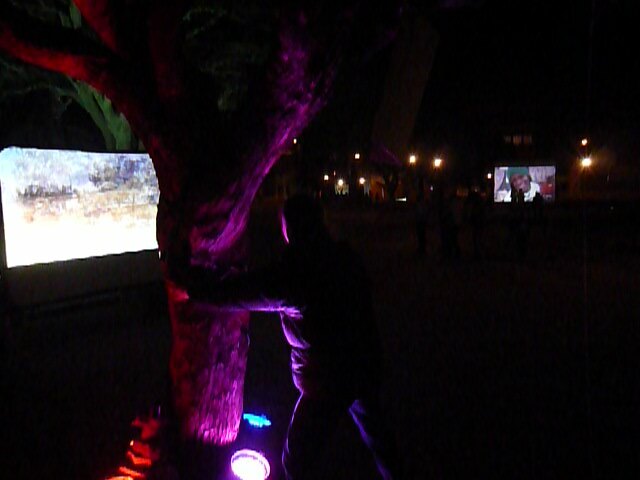 The audio and video data was taken from four sites around the park, both using conventional microphones as well as contact microphones and wall sensor modules, and video was also taken from these four sites – with one sensor representing one ‘site’. 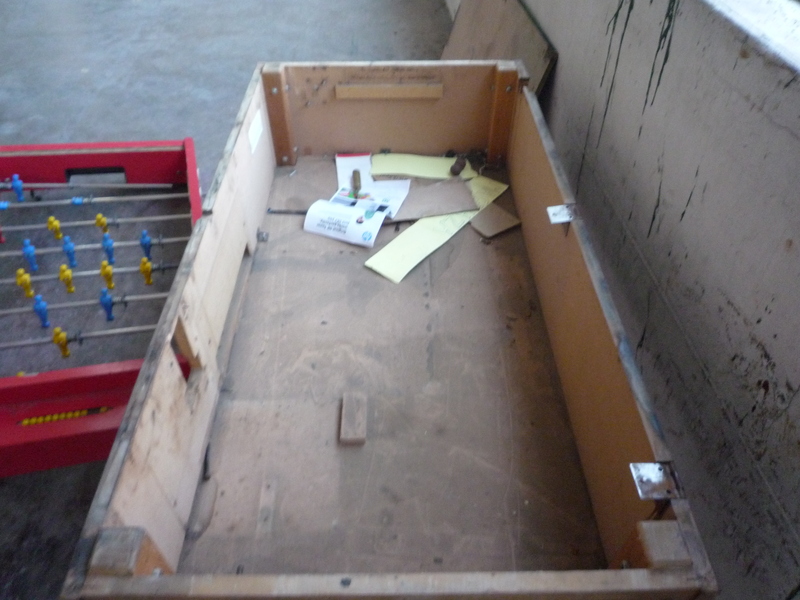 In this way the participants (purposefully or accidentally) would introduce ‘channels’ of video and audio, to create their own experience of this supernormal locus of identity. 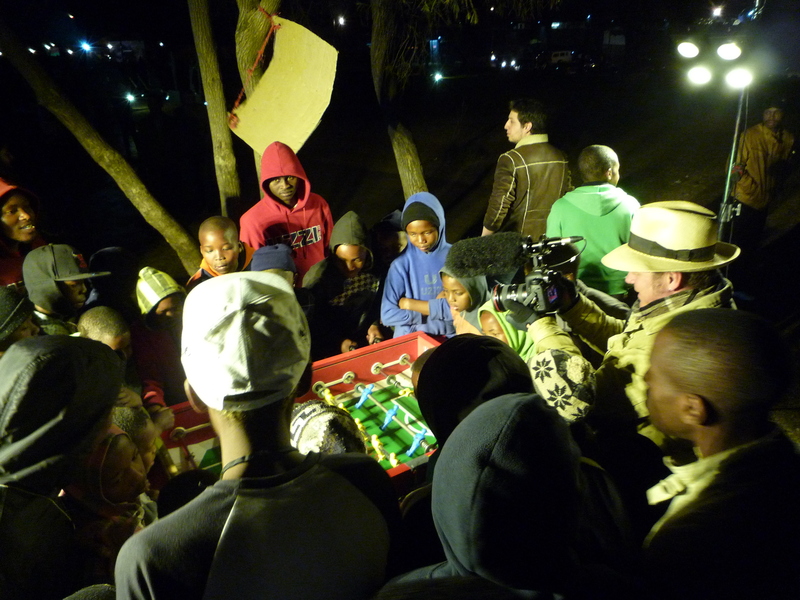 I was then invited to go to Johannesburg with ISIS arts and The Trinity Session along with Lucy Carolan, Richard Glynn, Andrea Masala, Marek Gabrysch and Charlotte Gregory to produce work for the Superdream event in Jeppe Park as part of the British Council’s Connect ZA programme. For this event I presented a redesigned version of my work for Windmill Hills, using material gathered from Jeppe Park, working on collaboration with South African artists Em Kay and KMSN, and re-coded the installation using Max/MSP/Jitter and the NewPing library. 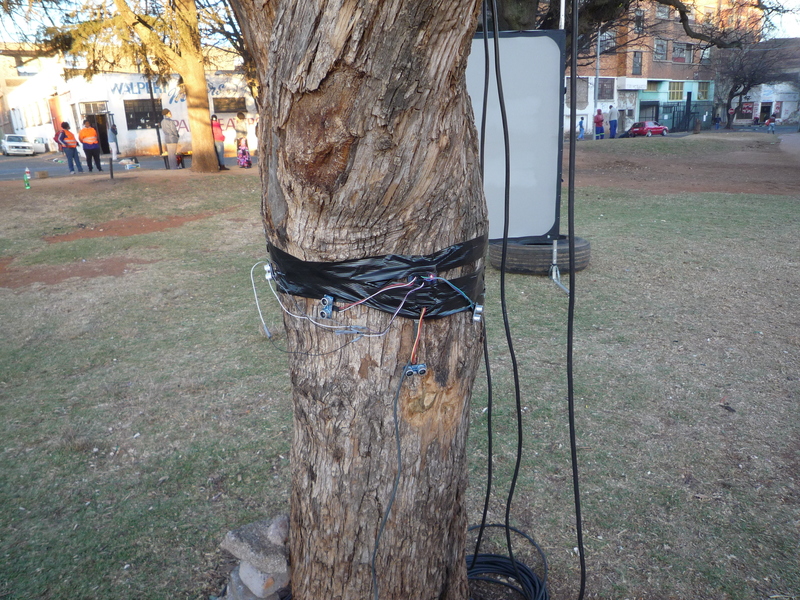 The four sensors were nailed to a tree in Jeppe Park and the participants were invited to interact with it as they pleased, again creating their own experience of the artwork, it lying dormant until interaction was detected. 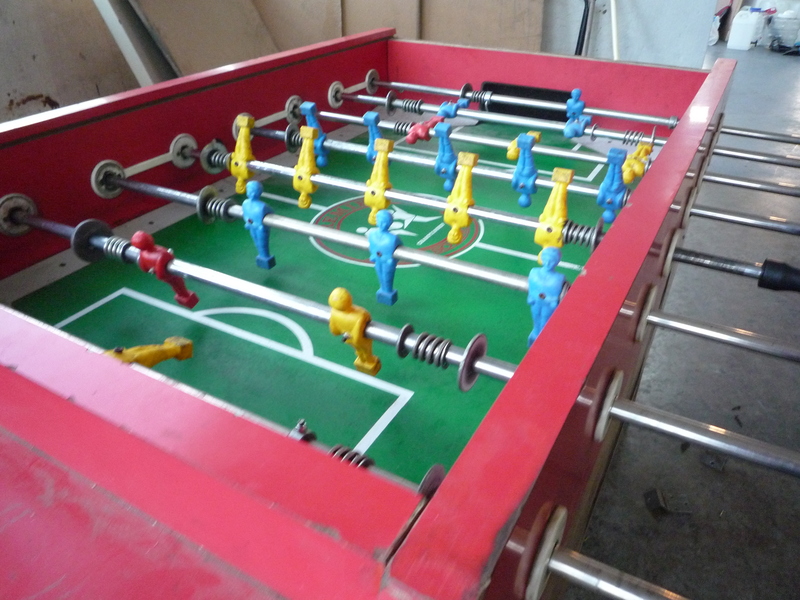 For this event I also created a piece based around a table football table sourced from a workshop next to the park which was close to a state of disrepair. 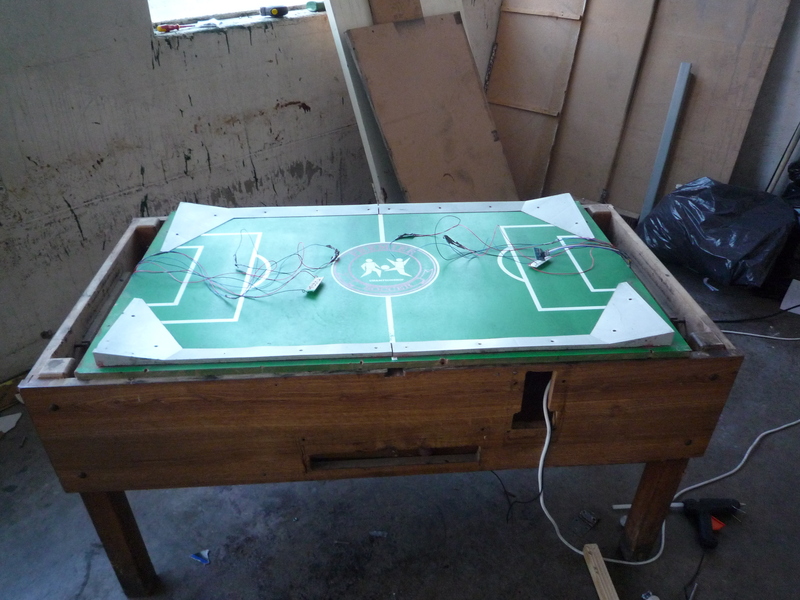 With the help of Marek Gabrysch the table was able to be restored to it’s full working condition, and I augmented the football table with sensors in the goals, as well as small buffers next to the goals to wire the football table for sound, with a small selection panel on the side of the football table, players could select sounds which were triggered by hitting the buffers, and a random ‘Goal!’ sound would be triggered when a goal was scored. 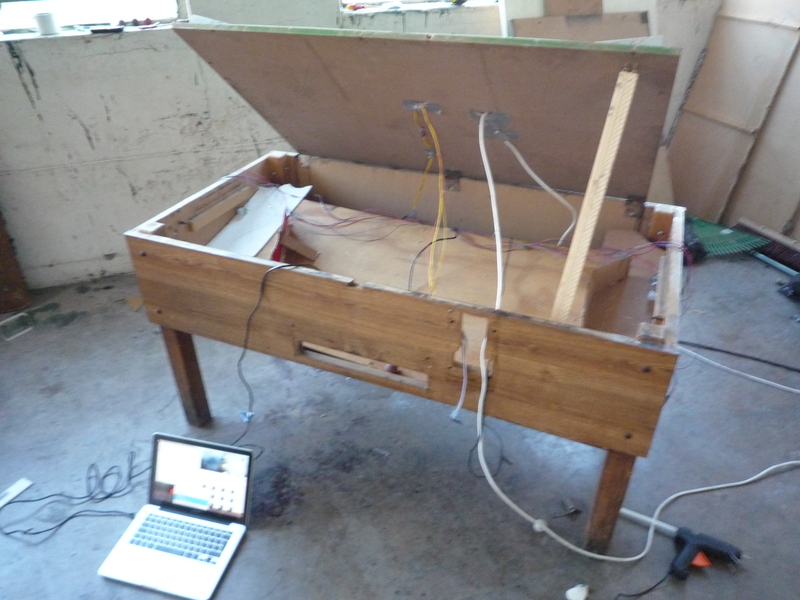 This installation was created using an Arduino Mega 2560 and a Raspberry Pi running Stanford University’s Satellite CCRMA operating system. 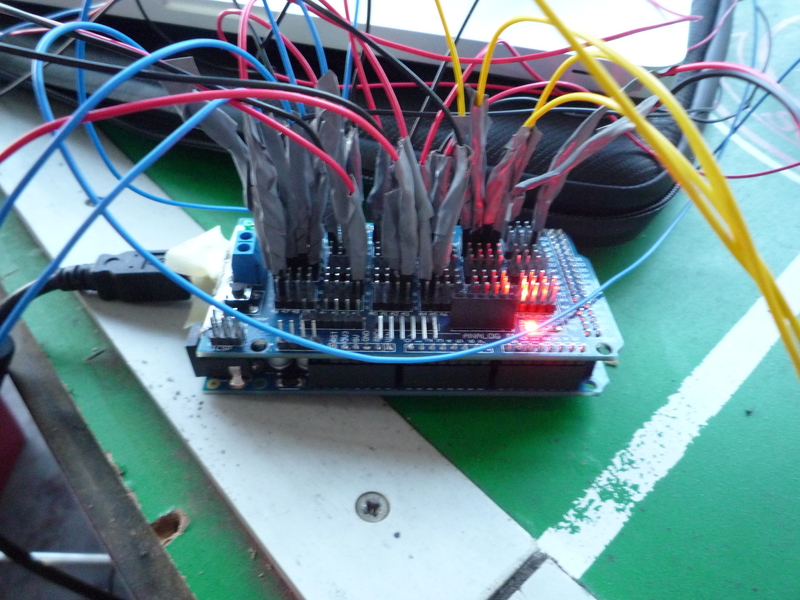 I designed a patch in Pd-extended interfacing with the Arduino using the Firmata software, which was then run from a headless Raspberry Pi which handled the sound. 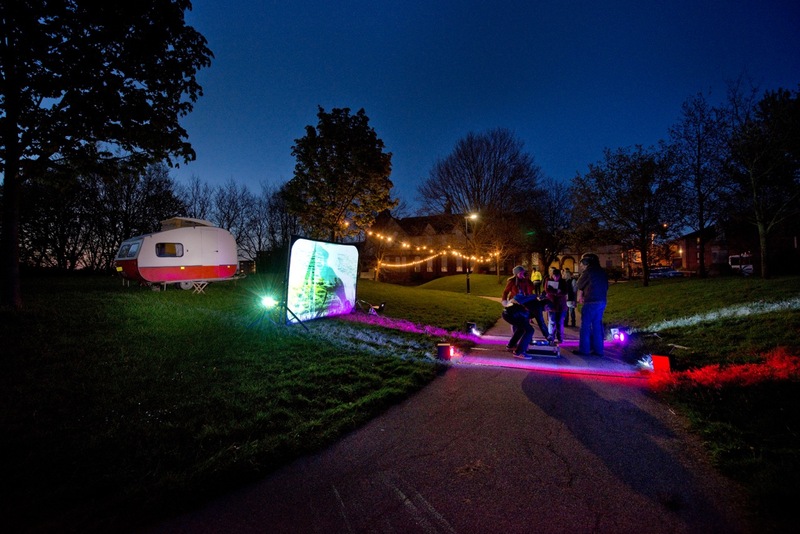 It was very much a prototype – a bespoke installation for the park. 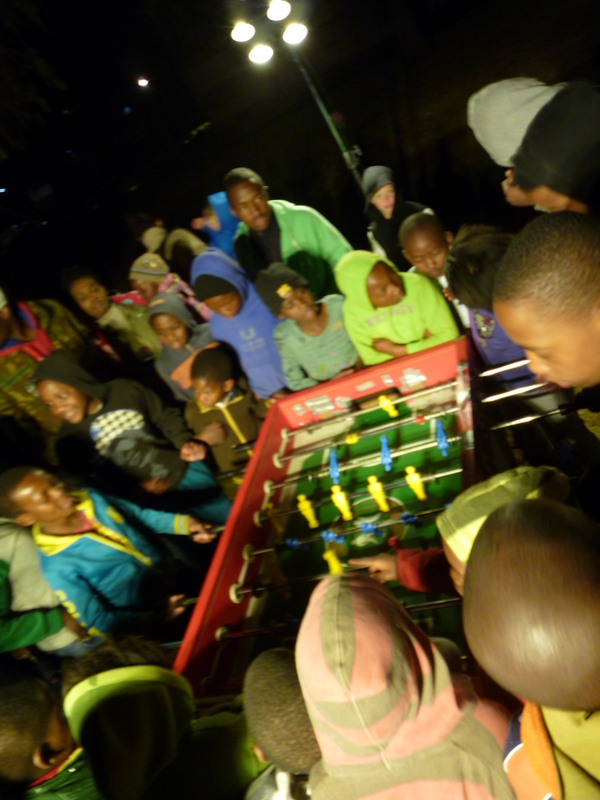 The installation was very popular with the local children and thanks to some fantastic refereeing by one of the South African artists there were quite a few hotly contested games!